Ratings are averaged based on 49 reviews. Thankyou Bintang Bali Resort. The place was absolutely beautiful as were the staff. Nothing at all was a problem.We were looked after extremely well. We have stayed here with our 2 children (6 & 8) four times. All the staff are so lovely and very happy to help.The gardens are absolutely beautiful and very well kept. There are squirrels that the kids love to watch. The pool is large so there's plenty of space even when it's busy. It's easy to walk to shopping centres, markets and restaurants. The rooms are old but have plenty of space. We stay in a Family connecting room facing the gardens. The rooms needs updating, very disappointed in the themed bbq nights. Did not get one at all was advertised that they would happen. No mention that it’s seasonal. Breakfast was great. Staff were very pleasant and polite. The outside garden and pool was very beautiful and relaxing. Quite large resort but surprisingly quiet. Very welcoming staff, rooms are spacious and clean. Would be happy to go back! A resort for everyone to relax and rewind in the sun! We were fortunate to be upgraded to a superior room though saw other rooms. All rooms spacious, clean with a balanese feel. The grounds, pool activities and food very nice. Staff very friendly but English poor so needed clarification of deels and dinner. Our deal included a meal which was lovely. 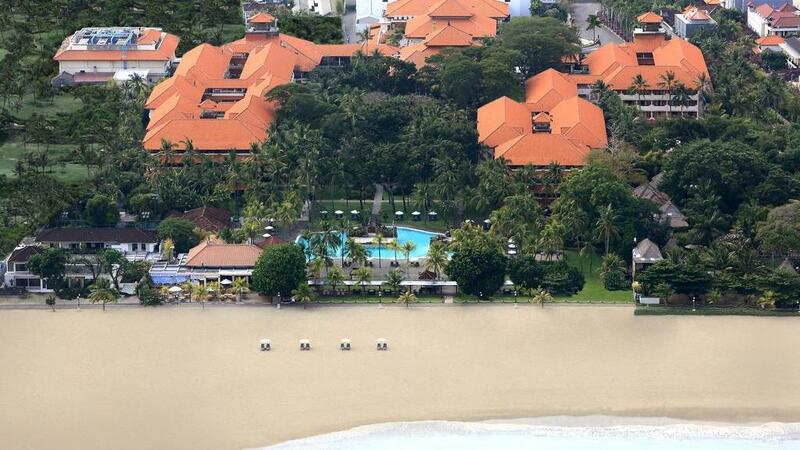 This resort includes a small private beach with few scalpers and a beachside walking track to town. Very close to waterbom and the airport. We loved this resort and enjoyed our time hanging out at the pool and our room relaxing. Kuta night life is not for us but we loved this peaceful relaxed resort. Can’t wait to return! What a wonderful Resort to stay in! The staff were friendly and extremely helpful. The breakfast and right through to the food and entertainment at the Wharf at night was first class. The gardens and pool were stunning and well maintained. A great location to access all the shopping of Kuta,waterbom park and dining. Will be returning and recommending the Resort. Fantastic location. Staff very friendly and fast. Bali has many resorts but one resort stands out in front Ramada Bintang Bali Resort the best!!! Have stayed at Ramada Bintang Bali Resort 2 times now & will definitely be back again next time. My family & I would highly recommend staying at the resort for everything you want for a great Bali holiday, their staff are will make you so welcomed you'll not won't to leave. I give the resort a 5 star rating well deserved. Ramada Bintang is conveniently located neas Waterbom Park, and Discovery and Lippo shopping malls. The hotel itself is older style, great gardens which go all the way to the beach for sunset drinks. Pool area is great, no loud music. Staff and breakfast are exceptional. Love the place but the beds are hard and the bathrooms need a bit of a refresher. Staff awsome. Location awsome. Love the place but the beds are hard and the bathrooms need a bit of a refresher. Staff awsome. Location awsome. been there 5 times now and are very settled there. We spent 11 nights and enjoyed our stay. The staff were excellent and the service overall very good. The deluxe room was adequate, although starting to age. WIFI was strong in rooms and always available. Poolside bar and Wharf restaurant were vey good and the Seafood buffet night around the pool was a highlight. Plenty of food choices nearby and shopping areas close at hand. beautiful, lush tropical gardens and right on the beach. Discovery shopping mall is a short walk along the boardwalk by the beach. A quiet, relaxing haven but a good location for everything you need; restaurants abound both on the beachfront or roadside. The hotel is in a great location. Away enough from Kuta to be peaceful however a walk away from great restaurants, shopping, Waterbom, etc. Good sized family room for four in beautiful gardens. Room and all areas very clean. Pool area was great for both adults and kids. Right on the beach ready for sunset every night. The staff are very friendly and helpful as the Balinese are. Kids made lots of friends and could roam around the hotel together and be safe. Only downsize is the hotel could need a bit of a refurb. I would totally recommend it. Always a great place to stay and the staff are always so friendly. I would strongly recommend this property to anyone that is looking for the perfect place to sit back and relax but also be close enough to enjoy everything that Bali has to offer. We loved Ramada. The pool was fantastic for kids. Restaurant and drinks poolside were a bit pricey. Very clean, great gardens and modern. Having stayed at both jaykarta and Ramada, we found Ramada was a lot more modern but we liked the location and price of jaykarta better. Would recommend Ramada Bintang to everyone. Was very private and amenities were good . Staff was always courteous and helpful. The ramada has a lovely location good pool and staff are very friendly. Fourth year in a row we have stayed here 2 weeks with two kids under 10, and we love it. Great location, friendly staff, nice pool, great breakfast, family room is fine but a little dated so just dont expect 5 star perfection and you will have a great time. My wife and two adult children totally enjoyed the resort to the point of we will be coming back more often during our winter time. The staff was wonderful, do anything for you. I felt very safe, the resort was quiet and relaxing. The pool was a big hit as well as the food, very important issues. Just the place we were looking for to relax. Checkin was pleasant and easy. We had booked two connecting rooms and were pleasantly surprised to have been upgraded to a large family room facing the pool and beach, absolutely stunning. This hotel is very big so I would recommend asking for rooms closer to the pool. Pool was big and you could swim pretty late without being asked to get out. Friendly bingo games by the pool bar everyday with drink prizes was a good laugh and an oppportunity to meet other guests. Staff were friendly, efficient and very helpful. Always smiling and greeting. Buffet breakfast was at a good standard but have had better. Themed buffet dinners with cultual shows at least 3 or 4 times a week and if you chose not to dine, you could still sit and watch the show. Dining at The Wharf by the beach and sunset was fantastic, great sunset watching and music entertainment. Overall we had a lovely stay here and our two girls 4 and 14 did too. Sorry cannot comment on the kids club, we didn't go near it and the gym we walked past seemed to look pretty good too.. All shopping was in walking distance, yet if you took a taxi into kuta square, the average price was about $1.50.. Enjoyed being walking distance to Kuta but far enough away to retreat. Close to airport reduces travel time, which makes it easier for families with small children. Clean rooms, great service, friendly staff. Large pool ensures you are not swimming on top of others. Bit expensive at peak time in July - cheaper options available. Looking a bit old, but still a very good hotel to stay at. Staff very efficient and always happy. Rooms are comfortable and clean. Have stayed there 3 other occasions, would highly recommend to everyone. Very relaxing resort. Ideal for one person or a family. Staff are extremely friendly and helpful and the resort is very clean & tidy. Overall a good place to stay. I would have liked the air conditioner to be cooler, which I asked for several times without any action. Otherwise a great place to stay. Nice pool, grounds and excellent staff. Good entral location too, we walked pretty much everywhere. We found Ramada to be a great place to stay. The staff were fantastic the kids loved the pool the food was amazing. We met so many other families and the kids made friends. Overall it was a really nice place to stay especially if it's your first time in Bali. The Hotel was more than I had expected. The people were friendly and helpful and really went out of their way to please you. There was a little confusion on depature but Hotel helped big time. May suggest a later check out iof the flights are lat in the evening. My wife and myself would like to extend our appreciation especially to The Warf Restuarant they looked after us like first class. We loved our stay in Bali. The RB is a lovely resort with very friendly & helpful staff. Loved the pool, had some great spa treatments, close to shopping and most importantly Waterbom park (for the kids). We would return to this resort / location on our next Bali trip. This is the second time we've stayed here and will do so again if we get a chance to travel to Bali again. The staff here can not do enough to make your stay here enjoyable. Great location and wonderful facilities. third consecutive year and we love it (wife & 2 kids under 10). great location, attractive grounds, good pool, friendly staff and fantastic breakfast buffet. rooms (family) slightly dated but do the job. wouldn't stay anywhere else. the best location if you want to surf the reefs while the family is at the pool. Fantastic location - walk to Waterbom park and Discovery Centre. Rooms spacious and service good. Pool area big and clean. Breakfast buffet great. Great hotel - would definitely stay again. Accommodation, location and staff were great. The food was fine but pretty basic. Very happy with the experience, thank you. The resort was just lovely. Well kept and maintained with most helpful staff. It catered for all of us and was in a great position for getting around locally in Kuta. Shopping and Water Bomb all very close. The staff were extremely helpful and polite. It was very centrally situated. We loved our sty here and would not hesitate to book to stay here again. Great accommodation for a family of five. We would've liked to have had an \"outside bar\" where you could sit and have a chat and a drink whilst dry (not in the pool) and still watch the kids in the pool. Also the menu didn't change between restaurants and in room dining. But room, grounds, pool lovely. Breaky was good although had to serve our own coffee (no big deal). Close enough to shops and restaurants. Room cleaned everyday was bliss. My family & I stayed 10 nights at the Ramada Bintang, my rating is 11 out of 10. From arriving to check out our stay was simply fantastic. Total stress free & just enjoyable, the staff, location, facilities, amenities, etc, etc.... were first class and having travelled in Asia for over 30 years, I can speak with some authority. The real standout were the fantastic staff, just so genuinely friendly, honest, professional & helpful, they went above & beyond to ensure my family & I had the best holiday in many years. I highly recommend the Ramada Bintang as having all you need & more if you want to come to Bali for a holiday experience (my first time in Bali) definitely not my last. To all the staff & management my sincerest thanks & graditude for making my family's holiday so memorable, it was simply very \"bagus\". \"I'll be back\" please keep my bintang beer on ice!!!! Stay there you'll love it!!! !